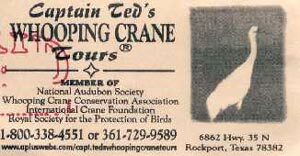 An early start meant we reached Rockport just around dawn, just in time for the famous Captain Ted's Whooping Crane Tour. The sky was overcast and the wind made the sea choppy. This didn't deter the Laughing Gulls from floating on the breeze over the carpark. It also didn't deter us as we charged onto the boat and took our seats. The boat quickly set off and we strove to see and identify birds through the spray-covered windows. Our first bird was Common Loon soon followed by American Herring Gulls and Double-crested and Neotropic Cormorants. The boat (including coffee, doughnuts and toilets) headed out along the Intracoastal Waterway and took a right into Copano Bay. It was then that everyone abandoned the seats to stand on either the lower or upper deck. We cruised alongside a flat and open area of marshland and pools and soon saw three individuals of our target species for the area: Whooping Crane. Having seen these birds from a distance the boat moved closer for a better view. As we approached the bird list grew: a Great Blue Heron flew past, a singing Eastern Meadowlark perched on a post, Red-winged Blackbirds and Willet were common, a couple of Northern Harriers quartered the marshes, Royal and Gull-billed Terns flew over the boat, and Black-necked Stilt, Spotted Sandpiper, Roseate Spoonbill were seen over or on the marsh. Two Reddish Egrets were seen in flight as was a flock of seven White-faced Ibis. American Avocets and Snowy Egrets put in various appearances as did Caspian Tern, American Coot, Forster's and Common Terns. The boat stopped near three Whooping Cranes (two adults and a juvenile) and we picked up Seaside Sparrows as we watched them. 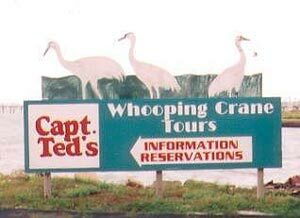 The boat took us further along and we saw 10 Whooping Cranes in total - a decent proportion of the world population. Sadly, the boat had to turn back sometime but the birding didn't stop: Black-bellied Plover, Greater Yellowlegs, a close flypast of five Brown Pelicans followed by an equally close flock of 56 White Ibis. A Belted Kingfisher flashed past, avoiding most people's eyes, but two Black-bellied Whistling-ducks were seen by all. Also seen were three Northern Shoveler, three Canvasback, Semipalmated Plovers, at least five (at different times) Tricolored Herons, more Common Loons, two female Red-breasted Mergansers, Sandwich Terns, two American Oystercatchers and, on the water, at least 110 summer-plumaged Eared (Black-necked) Grebes. As we entered the harbour there was a nice Black-necked Stilt on the small harbour wall alongside the Laughing Gulls. From the entrance to the carpark we added a soaring Peregrine. As we drove along the waterside road we added two Redhead, a close view of Neotropic Cormorant, Ruddy Turnstone and four Mottled Ducks.